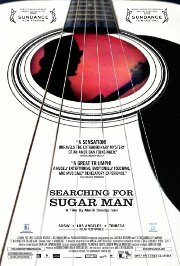 This well-rated documentary tells the incredible true story of Rodriguez, the greatest '70s rock icon who never was. Discovered in a Detroit bar in the late '60s by two celebrated producers struck by his soulful melodies and prophetic lyrics, they recorded an album which they believed would secure his reputation as the greatest recording artist of his generation. In fact, the album bombed and the singer disappeared into obscurity amid rumours of a gruesome on-stage suicide. But a bootleg recording found its way into apartheid South Africa and, over the next two decades, he became a phenomenon. The film follows the story of two South African fans who set out to find out what really happened to their hero. Their investigation leads them to a story more extraordinary than any of the existing myths about the artist known as Rodriguez.